If you have ever traveled to Disney World or Disneyland, or even the Disney Cruise Line, you will likely be familiar with the small, blue books and over sized pens that many families carry around with them. These are autograph books, and their purpose is simple and pretty self-explanatory: when you wait in line to meet a character, you take your picture with them, then ask them to autograph your book. Disney sells them for about $8, but keep in mind you will definitely need a different one for each of the kiddos you have with you. We used Disney’s book for our first couple of trips, but we started running into some problems with them. First of all, their function was a little too narrow for my liking; and when I tried to add features to the book, the spine would usually break. For example, I thought it would be nice to add a picture of my son and the character on the page adjacent to each autograph (asking the characters to sign on every other page). It’s a fine idea, but the book isn’t made to handle what is essentially twice the number of pages that were bound into it, so the spine couldn’t take the book’s new heft. That’s when I decided to just make my own book for our next trip. I did, but that first homemade book didn’t fully capture the balance of the main function (autographs) and the extra features that I wanted. The following year, however, I came up with new books that the kids loved keeping handy in the parks for the whole trip. Each kid got his own book with its own color, so they were easy to differentiate. 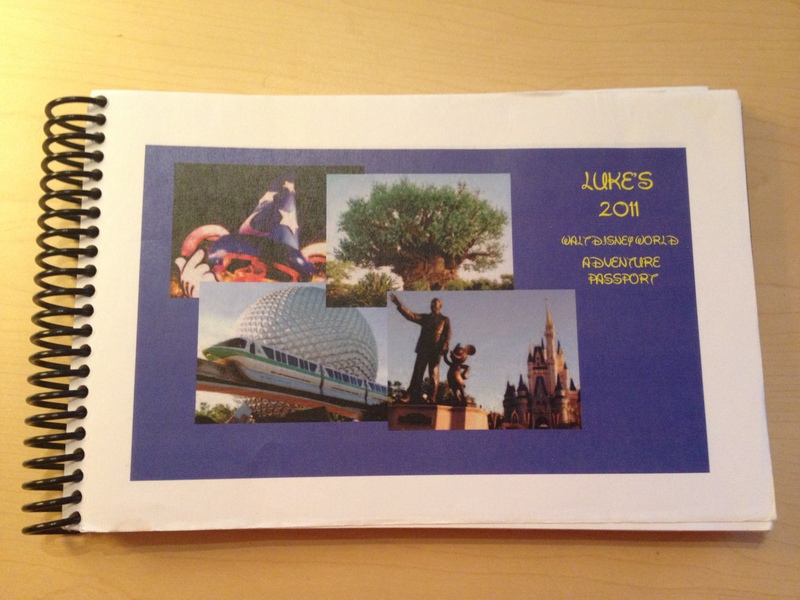 Each of the kids had their own “Walt Disney World Adventure Passport” (I know, it’s a mouthful). I created them on Word and just copied and pasted to make two identical pages on each 8½x11 sheet. I printed the whole stack at home and took them to the local Staples. They cut the pages in half for me (basically separating the two books), added a clear plastic cover, a firm blue or red back cover, plus another piece of the red or blue as a “divider” between the activity section and the autograph section (I paid for the 8½x11 sheet of plastic, so why not use the whole thing?). They held it together by using a basic spiral binding. The whole Staples part of the process for both books cost about 3 bucks total. The book has 3 main sections: Our daily schedule, attraction checklists sorted by park, and autographs. The daily schedule section has a page for each day that lists our basic plans (day, date, park we were visiting). 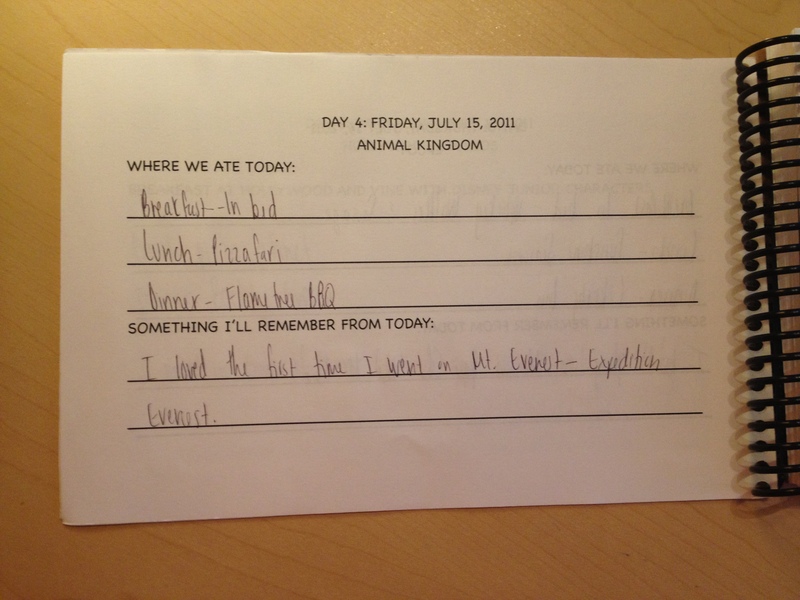 The fun part for the kids was filling out the rest of the page with information such as where we ate that day and something they will remember from the day. It was a fun activity that we usually did during dinner, if we were at a Table Service restaurant, or after we got back to the room and the kids bathed and were getting ready for bed. While the restaurants were the same, the bottom half of each page was different for each kid. The second section has colorful pictures of each attraction from the parks; the attractions are organized by park, and further organized by land. 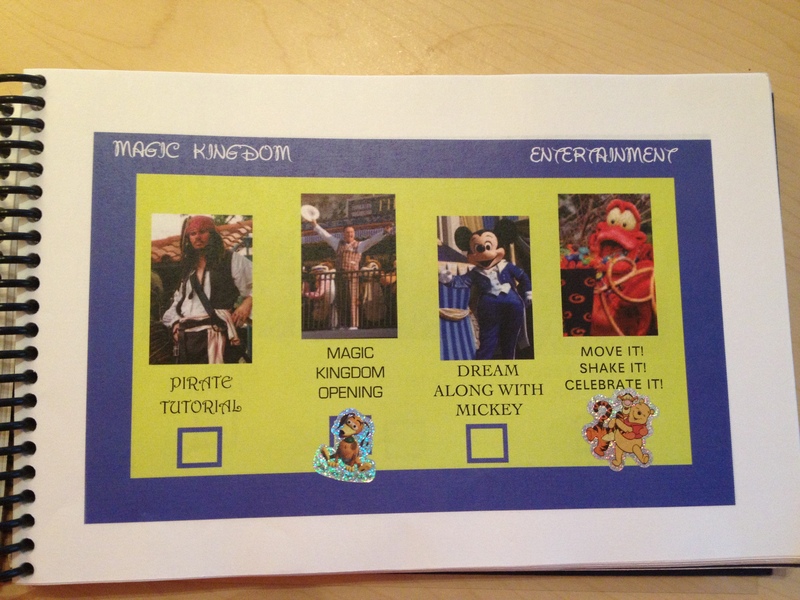 There are 2 to 4 attractions shown on each page, with a box to check after we experience the attraction. Before we left for vacation, I went to the dollar store and picked up a few packages of small Disney stickers. Instead of checking the box, we would put a sticker at each attraction that we did. My older son (he was almost 5 at the time) LOVED this part of our trip. After each ride, he couldn’t wait to run over to his brother’s stroller, find the book, and add his sticker. Within the Epcot part of this section, there was a subsection devoted to the countries in the World Showcase. 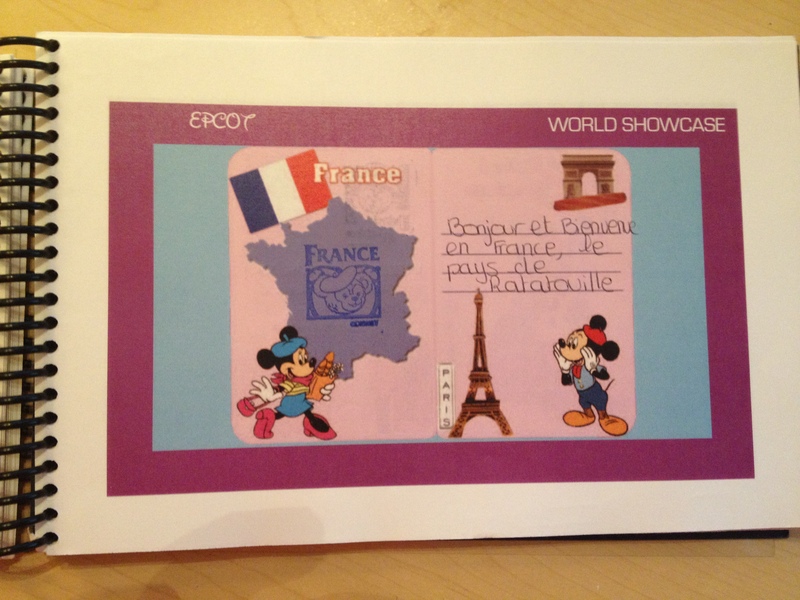 Each country got its own page and has room for a passport stamp and a personal greeting from a cast member. This section takes the place of Epcot’s Kidcot World Showcase Passport, which sells for $10 in the park. This was another activity that the boys loved doing and it made our trip to the World Showcase very memorable for them. Most Cast Members who are running the Kidcot tables are ready and willing to sign books in their native language. The final section is, of course, for autographs. This is nothing complicated, just lots of empty pages for the characters to sign. 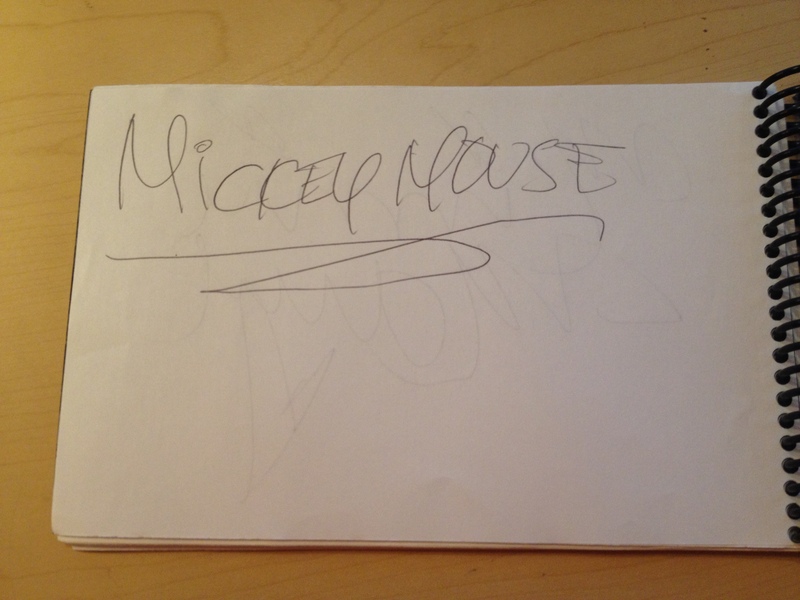 He always gets the first autograph page of the book. We were happy with the books, and the boys really enjoyed the added features that made them activity books more than simple autograph books. There are a couple of thing I might do differently next time we go. First, I would maybe add some coloring pages to the back of the book to occupy the kids at meals. Coloring pages are very easy to find for free on the internet, so it would have been just as easy as printing them out and attaching them to the stack of pages that Staples bound for me. I would also try to add a sturdier piece of cardboard or plastic as the back cover. The book are a little flimsy feeling, due mostly to the wide spiral binding that was needed to accommodate all of the pages. Otherwise, it was a great book, and I can’t see myself doing autograph books any other way in the future. This is a great idea, J.R. This one gets credited to my creative partner Domenic. 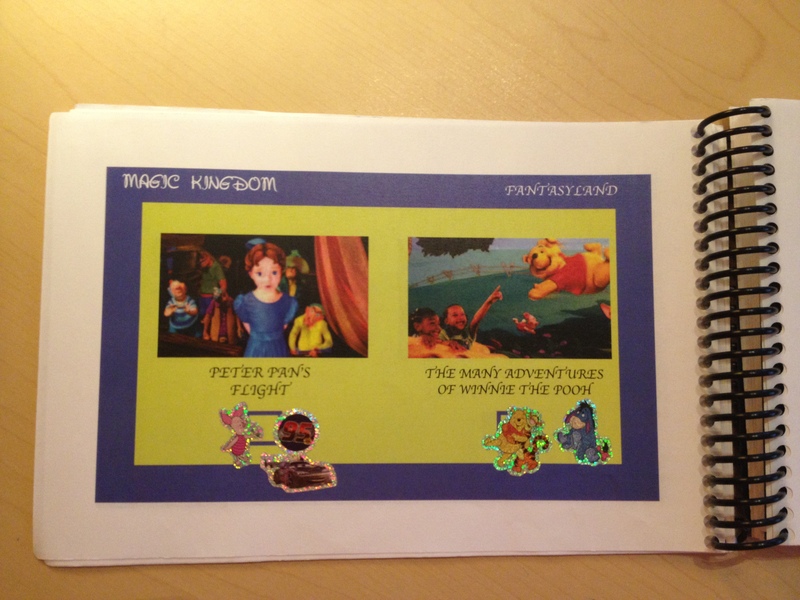 I will be encouraging him to make my kids these books for our next trip! What a great way to remember each trip! I love the sticker idea especially as the kids can keep track of who they had already visited with and who they need to look for each day!